For a midsize firm, STUDIOS Architecture has developed quite an enviable portfolio. Among its clients are Coca-Cola, Nickelodeon, Georgetown University, Estée Lauder, Apple, Mashable, Google, Pandora, Alexander McQueen, and Sirius Radio. Whether hip tech offices, environmentally sustainable interiors, corporate master plans, or university and residential designs, its wide-ranging, creative work is drawing recognition within and outside the architecture community for its ingenuity and freshness. 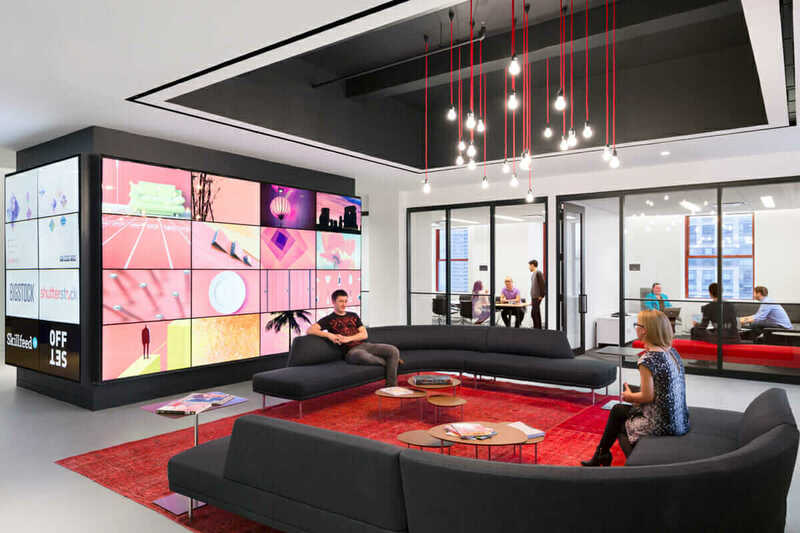 STUDIOS’ design of Shutterstock’s New York offices, for instance, recently made Italian magazine Grazia’s list of coolest offices in the world, and the firm also made Architect’s Architect 50 list in 2015. Eric Gratacap, associate principal at the Paris office on the Champs-Élysées, reveals how a firm of nearly 300 people—with almost 70 in Paris—manages to commission such interesting work and stay in high demand. Shanghai International Dance Center. Courtesy STUDIOS. 1. Give Clients What They Want. It may sound simple, but honoring a client’s wishes is key to developing a strong reputation as a small or midsize firm. 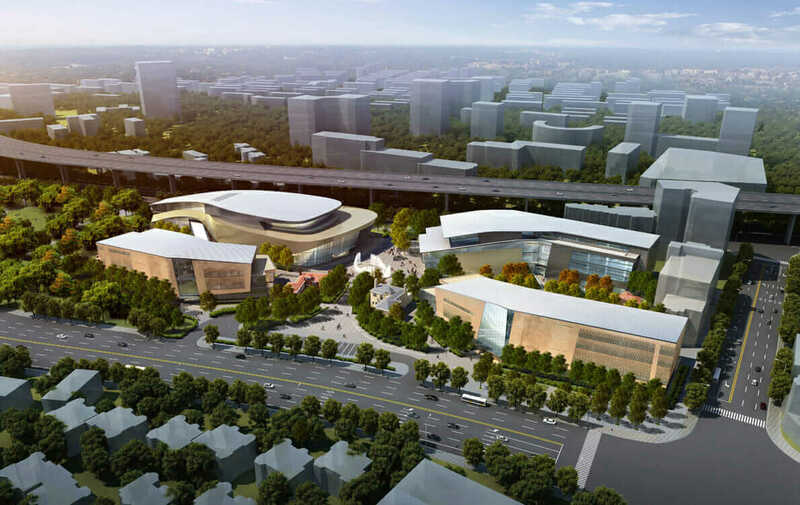 STUDIOS recently won an international design competition for the 915,000-square-foot Shanghai International Dance Studio campus, which includes a theater, recital hall, and the Shanghai Ballet’s and Shanghai Dance Troupe’s headquarters and rehearsal studios. At home in the bustling Chinese metropolis on the mouth of the Yangtze River, the graceful scarf-like form subtly reflects the spirit of dance. By situating nearly half of the program below grade, the design preserves significant open space—a collection of courtyards, curving paths, fountains and arching tree rows—while incorporating several on-site historic buildings. “The design was timeless and elegant without being flashy, and this resonated with our client as well as made the best use of the site,” Gratacap says. 2. Be a (Masterful) Jack of All Trades. Being proficient with projects of varying scales, site considerations, and typologies also helps. 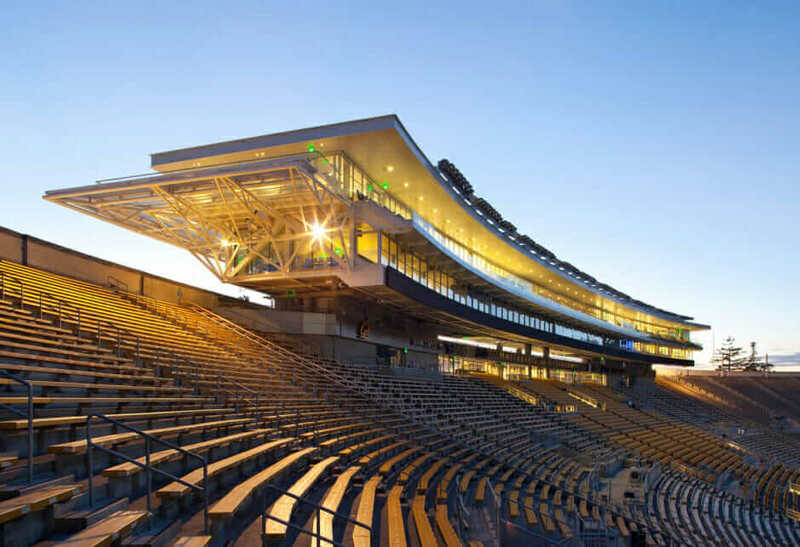 UC Berkeley’s historic California Memorial Stadium, built in 1923 and resting on the active Hayward Fault line, needed a major overhaul to restore it to prominence and withstand the force of potential seismic events. In response to those varied considerations, STUDIOS joined forces with HNTB Architecture to design a new wraparound training facility for football and Olympic sports; called the Simpson Training Center, it features a two-acre public plaza on its roof. This landform extension freed up space in the original stadium, making room for a concourse and amenity areas. UC Berkeley’s California Memorial Stadium. Courtesy STUDIOS. 3. Establish a “Local” International Presence. An internationally active firm, STUDIOS has offices in San Francisco; New York; Washington, D.C.; Los Angeles; Mumbai, India; and Paris. The Paris office was established in 1992 to serve the needs of U.S.-based clients such as 3Com, Apple, and SGI, which were developing projects in Europe at the time. But the international offices don’t just respond to the needs of global clients; they create new business by sharing resources. Knowing a thing or two about French building law has also helped Gratacap pursue new projects from within the Paris agency, where he relocated in 2013 after being promoted from his position in the San Francisco office. Like much of his work in Paris, one of his recent designs, a restructured tower standing before the Gare de Lyon train station, required close attention to strict French building practices and Parisian history. Refashioned as a hotel, the structure features a streamlined façade with illuminated rails, reinterpreting the legendary train station’s history in a respectfully contemporary way. “In the U.S., the market is booming,” Gratacap says. “Here in Paris, it’s different; it’s not quite booming. Our office is bucking the trend. We are an international firm, and that helps quite a bit. Whether it is a historic building or location, the design will be impacted. “Oftentimes, we don’t have the liberty to do something that is completely out there,” he continues. “Here in Paris, we have to do an elegant write up, explain why we design a building in a particular way, create the narrative of the building, and submit it to the city and various governing bodies for approval.” That kind of expertise requires local knowledge and contextual design. Shutterstock reception area on the 21st floor of the Empire State Building in New York. Courtesy STUDIOS. 4. Create a Human Experience. One of STUDIOS’ most widely publicized projects is the Googleplex, the sprawling 26-acre Google campus in Mountain View, California. Originally designed as SGI’s (Silicon Graphics) corporate headquarters, the design integrates internal courtyards, public-access trails, and fitness and dining amenities in an immersive environment resembling that of an elite research university—a bold departure from the stuffy corporate campuses that predate it. 5. Go 3D. For STUDIOS, technology is at the heart of that human experience. Prior to coming to Paris, Gratacap led the transition, in the United States, from STUDIOS’ 2D documentation process to a model-based BIM design process that relies on Autodesk Revit documentation. He credits the software with helping STUDIOS perform better in competitions, sell projects to clients, and generally finish designs more rapidly and with fewer people. 6. Strive for Sustainability. In January 2015, Coca-Cola France moved into Noda, a 22,100-square-meter office suite in Issy-les-Moulineaux, on the banks of the river Seine. Led by Kristin Gratacap, STUDIOS performed the interior design, achieving the first ever BREEAM Outstanding rating for a fit-out in the world. 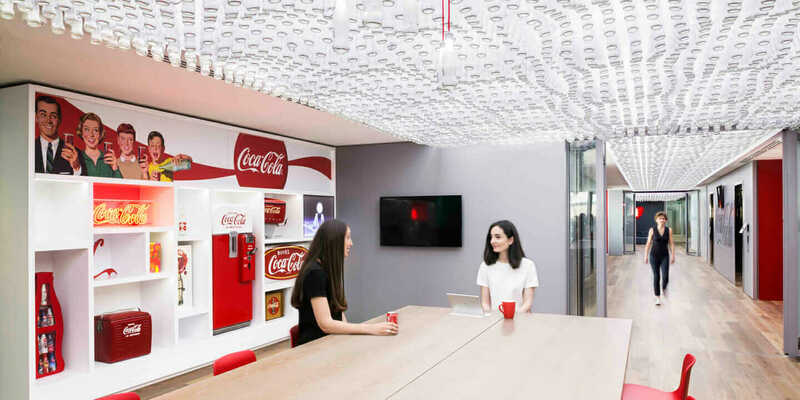 Coca-Cola’s signature emblem, the bottle (actually, 13,000 of them), is featured in an undulating LED light fixture hung in a shared workspace. “It creates a great entrance to their brand and materials,” Gratacap says. “It speaks to them.” And speaking to the client is what STUDIOS is all about—a sure-fire way to get more creative work.